Just days after the FTC barred mouth guard manufacturer Brain-Pad  from claiming that its mouthguard reduced the risk of concussion, a press release  on PR Newswire appeared touting supplemental helmet protective pads from a company called Unequal Technologies utilizing what it calls CRT (Concussion Reduction Technology). 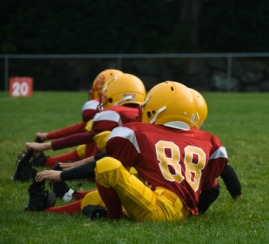 The article bears the headline, "2,000 Youth Football Players Converge on Cowboys Stadium; UNEQUAL Technologies Helps Protect Participants from Head Injuries at Battle X 2012." January 31, 2013 update: Unequal Technlogies' CEO, Rob Vito, told ABC New's expose on "Nightline ", that his company only claims to "help reduce the possibility of head injury," adding, "We never mention the word 'concussion,'" although the product's name is "Concussion Reduction Technology." Do you know of a product that claims to reduce or prevent concussions? I want to hear about it. Email the link to delench@MomsTEAM.com .